This set is most interesting because there are 4 little handpainted wooden Easter eggs in the doll. The set is in very good condition. Size : 4.8''. These dolls come from an “unknown” region of USSR. Pictures of similar dolls can be found on pages 62 - 63 of "A Collectors Guide to Nesting Dolls" by Michele Lefkovitz . 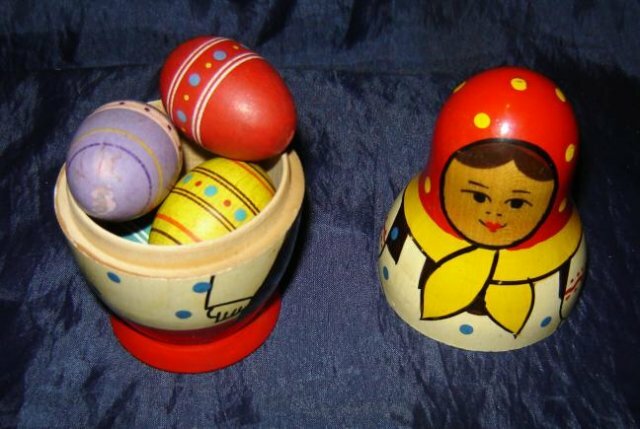 Curiously, this seller in Bulgaria later started selling other dolls like Semenov or Polkhov sets with these same eggs inside. We think that she is simply adding them to empty dolls.